The Pitch Is Dead! Long Live The Pitch! Wired‘s Chris Anderson ranted about inappropriate PR pitches and revealed some of the practice’s apparent practitioners by publishing a list of public relations pros’ email addresses as retribution for sending him untargeted pitches. I won’t defend the practice because I think it’s ineffective and a waste of time. I don’t spam people in general and certainly not journalists. If I want to pitch a journalist, I will find the most relevant publications or news outlets and find the beat reporter‘s email address, not the editor in chief’s. I’ll do a bit of research about the reporter and the stories s/he have covered to be sure I’ve got the right reporter. That just makes sense. And blind pitches do not make sense. But Anderson’s blacklisting and public posting of these people’s email addresses is petty, vindictive, and embarrassingly childish. First of all, everyone gets spammed. I probably get about 200 spam emails a day. It’s a fact of life. Deal with it. It makes about as much sense as throwing a hissy fit over getting direct mail. Just throw it away, fer Godsakes! Also, as one of the commenters to his blog points out, email addresses are incredibly easy to spoof. It’s entirely possible that some of the people on his list were themselves victims of spoofing and had actually done nothing at all wrong. Did he validate all the emails? I doubt it. Lastly, Wired.com doesn’t exactly do a stellar job of making it clear which reporters cover which beats, so some of the blame for Anderson’s grievance certainly falls at the feet of his very own employer. Still, Anderson’s post reveals, I think, an attitude many reporters have toward PR people that they are not to be trusted. I’ve seen this attitude in some reporters I know myself. I guess it’s understandable since we are at the tail end of an era in which the public relations profession was dominated by one primary tactic, spin. During the spin era, you highlighted the positive and ignored the negative. You reinforced your message through repetition of a clever phrase. The Spin Era went from the sublime ("It depends on what the definition of is…is") to the ridiculous (Mission Accomplished). The advent of blogs have rendered spin ineffective, even quaint. The roiling conversations taking place in the blogosphere have laid bare the inauthenticity of spin. People are now savvy enough to see through the catchy phrases and ask what is being hidden and what has been omitted. The spin cycle is broken. The manipulation of the Spin Era helped create an adversarial atmosphere between PR pros and the press, with the PR guys trying to spin their message into the reporter’s story, leaving the reporter frustrated and suspicious. It should be noted that this dynamic is certainly not universally applicable; the best PR people build relationships with reporters that are helpful and trustworthy, that serve both the clients’ and the reporters’ happily. Yet a there remains a significant amount of tension between many spokespeople and journalists, and perhaps part of the problem is the format of the press release itself. In this day and age, the traditional press release looks like nothing more than an inauthentic hype sheet that serves neither client nor reporter very well. And this may be where the Social Media Release comes into play. Instead of providing reporters hype, PR pros might simply supply the parts that make up the story: Sourced facts, quotes, photos, graphics, audio and video clips. What if reporters could subscribe to your news releases through the magic of RSS? Can the social media release become the new email pitch? Rather than attempting to shape coverage of a story, public relations practitioners might serve as a resource for covering the story. If PR pros become resources for reporters, facilitators that help them do their job, perhaps the journalists will seek out the spokespeople rather than the other way around. The roiling conversations taking place in the blogosphere have laid bare the inauthenticity of spin. 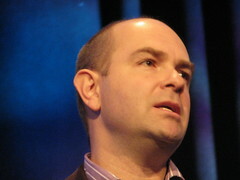 Wired Magazine’s Chris Anderson’s rant against PR pitches is only a symptom of a larger disease.